How else do you describe a season that involves losses to Army and Indiana State, but road wins over Bowling Green and Central Michigan and a near road upset over Iowa? An up-and-down roller coaster ride seemed like the most apt description for Ball State’s 2014. Will that trend continue or will the Cardinals find some consistency in 2015? 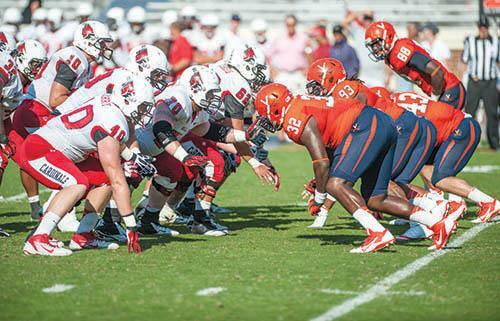 Everything starts up front for the Ball State offense. This O-Line has over 100 starts on its belt already if you include backup RT Nick Plavchak’s four. The right side of the line is particularly experienced with T Steven Bell, G Jalen Schlachter, and C Jake Richard accounting for 77 of those starts. The question is what does that experience mean? 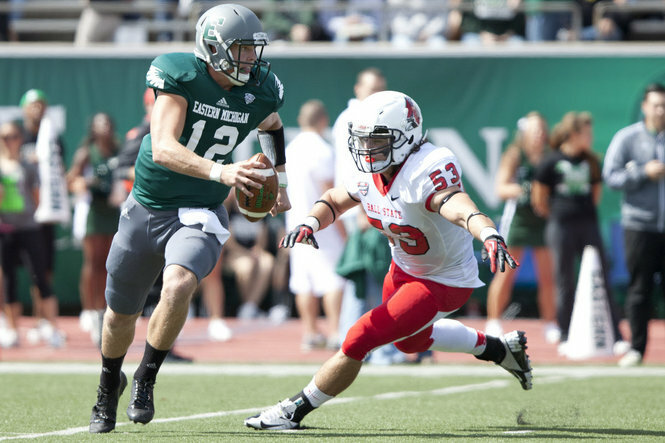 Ball State was good about not giving up sacks, but they struggled to pave the way in the running game. Those struggles should improve, and hopefully it will be to a respectable enough level for the Cards to field a balanced offense. Jack Milas and Ozzie Mann both have quarterback experience now, but they were both inconsistent last season. Depending on where you stand on two-quarterback systems, the best option might be to ride the hot hand and continue to alternate. Many people prefer the idea of picking your guy and sticking to him though, and if that’s your cup of tea then it’s honestly a coin flip but I’d go with Mann who threw more touchdowns, fewer interceptions, and completed a higher percentage of his passes. Freshman Riley Neal has also tossed his hat in the ring to compete for the starting gig, and was the most highly recruited of the three, although he obviously has no college experience. Receiving corps shouldn’t be an issue with leading receivers Jordan Williams, KeVonn Mabon and Chris Stallings all back. 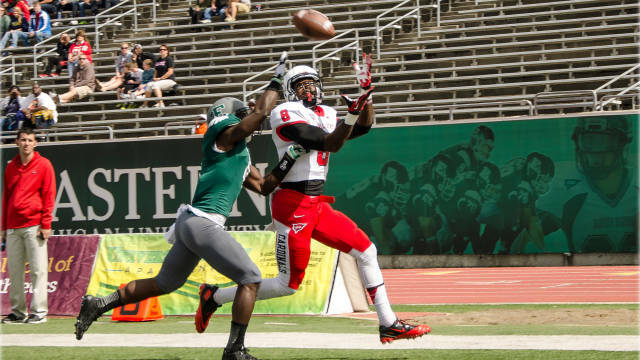 Williams was a 2nd team All-MAC receiver last year. The backfield is a little murkier with the loss of 1,200-yard rusher Jahwan Edwards. Horactio Banks, Teddy Williamson, and Darian Green return after serving in reserve roles last season, and true freshman James Gilbert could contribute immediately. Overall, the offense should be improved in 2015, especially in the passing game. Zack Ryan and Ben Ingle headline what should be at the very least a respectable linebacking corps. If it’s any worse than that, then Ball State is in a lot of trouble because it’s definitely the strength of the defense heading into the season, with the top 5 tacklers in the unit, including Ryan and Ingle, returning. Line play was an issue for the Cardinals last season, as they failed to crack the top 80 in any of the defensive line categories. If continuity can be counted as a positive, Ball State has it. Rush end Michael Ayers, defensive tackle Darnell Smith, and nose tackle Keenan Noel all return. The addition of Cincinnati transfer Joseph Posley at defensive end could end up being a big positive as well. With no pass rush, the loss of starting free safety Dae’Shaun Hurley, and plenty of other in-season injuries the secondary was never going to be very good. The good news at least is that a big jump forward doesn’t seem too farfetched for 2015. Hurley is back and Dedrick “Antonio’s oldest son” Cromartie came on strong at corner towards the end of last season. With those two anchoring the secondary, this group could be the most improved on the team. Ball State is still stuck in a tough division, and they aren’t ready to compete with the likes of Western Michigan, Toledo and Northern Illinois, but a .500 record should be attainable. Having to play NIU and Western Michigan on the road is rough and a trip to College Station to play Texas A&M in Week 2 is almost certainly a loss, but they get Toledo at home and the rest of their road trips, including Northwestern, are at least manageable. The Cardinals should be respectable in 2015 despite not being in contention for the MAC crown.